Stop by our free art-making station and make a custom iron-on patch, inspired by hippies in the Soviet Union! Soviet hippies were creative and expressed themselves through unique clothing that they designed themselves. Make a multi-colored peace sign, draw a hippie flower, or design something completely new! After you design your patch, you can iron it on at home, or take a safety pin to wear it immediately. Program materials and supplies are free! We will have the station up from 1-3pm or as long as materials are available. Join us for a special tour designed for families and younger visitors! We will learn about toys, youth organizations, and other aspects of life for children in the Eastern Bloc! 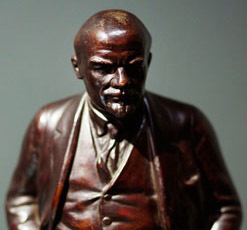 Meet at the Pink Lenin in the front lobby at 3pm to join this free tour!